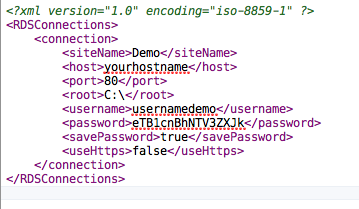 Opening this xml file in a text editor reveals all of the configuration information for any RDS sites you have set up. But wait, what the heck is in the password node? It’s not any password you remember. That is because when Dreamweaver stores an RDS password in it’s config file, it Base64 encodes it. So all we have to do is Base64 decode the password node to retrieve the true password. then you can do whatever you want with it. To Base64 decode your password you could do it a number of ways, I have included a php script that will base64 decode your passwords and spit back your password so you can see it. I’ll add a coldfusion script later. At this point you have successfully retrieved your RDS password from Dreamweaver. Feel free to pass this along. Simply save this code in a php file and run it.